Look no further than our cardboard postal tubes range when you want to post or archive B2-sized files and documents. Coming in a choice of 2 diameters, our top quality B2 packaging tube in rigid cardboard is strengthened by neat white plastic ends made specifically to hold the contents in place without snapping off in transit. The snugly fitting caps keep out dirt and dust, ensuring the mailing tube’s contents remain clean and dry while being stored or transported. Our postal tubes are an economical solution for packing your valuable files because they are recyclable and reusable. 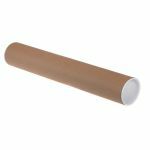 (707 x 500mm or 27.8 x 19.7 ins) our packaging tube will ease all your worries when shipping, storing or transporting these items. The postal tubes offer an ideal balance between strength and affordability. Constructed from stiff cardboard, our tube posters are made from recycled materials and can be used again or recycled again, which makes them environmentally-friendly too. Our cardboard tubes offer a visually attractive packaging solution while securing the contents. The postal tubes are supplied with white plastic ends that ensure your contents’ safety and protection. Designed especially to fit the packaging tubes, the end caps help keep your documents dirt and dust-free. Simply roll your documents, place inside and cap the ends. Our B2 postal tubes with internal diameters of 50.8 or 76 mm give all-round protection.